UNIST gives KRW 6.85 million to the Community Chest of Ulsan Korea to support low-income families in Ulsan. From left are Kyu Sik Jeon of General Affairs, Team Leader WonKyung Lee of the Community Chest of Ulsan, Administrative Director Hak-Sun Kim of UNIST, and Acting Team Leader ChangSig Kang of General Affairs. The donation ceremony took place in the reception room of Main Administration Building at UNIST on Dec. 12, 2017. 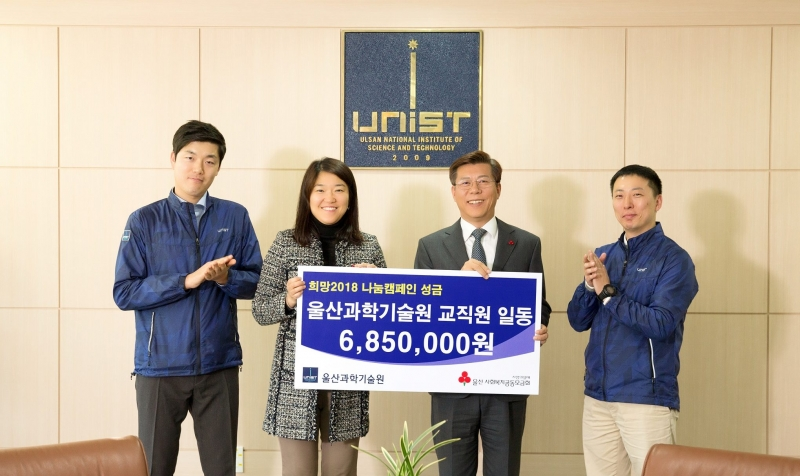 On December 18, UNIST delivered an estimated KRW 6.85 million donation to support low-income individuals and families in Ulsan. Administrative Director Hak-Sun Kim of UNIST, Team Leader WonKyung Lee of the Community Chest of Ulsan, as well as Acting Team Leader ChangSig Kang and Kyu Sik Jeon of General Affairs team were among the attendees at the donation ceremony, held in the reception room of Main Administration Building at UNIST. This charitable contribution has been collected and donated voluntarily by students, faculty and staff members at UNIST. The amount will benefit such lower-income families in Ulsan, under the Community Chest of Ulsan Fund. Every year, UNIST has been planning, organizing, and participating in a variety of charity events to help less fortunate people.